I’m celebrating National Grilled Cheese Month with this rustic and delicious grilled cheese sandwich. Ham and Havarti pair perfectly with sweet fig preserves to create the ultimate in comfort food. This post was sponsored by Arla Dofino. Tomorrow is Easter, friends. Can you believe it? 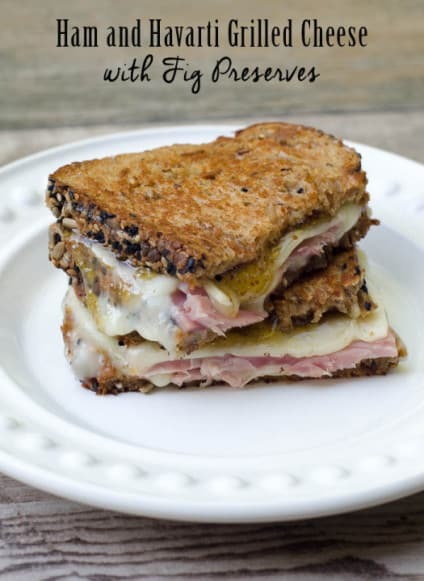 If you have ham on your Easter menu you really ought to use some of your leftovers and give this simple and utterly delicious little grilled cheese sandwich a try. If ham is not on your menu, deli ham will do the trick. Bottom line, get yourself some ham! You need to try this. The saltiness of the ham, the creaminess of the Havarti, and the sweetness of the fig preserves…it works. 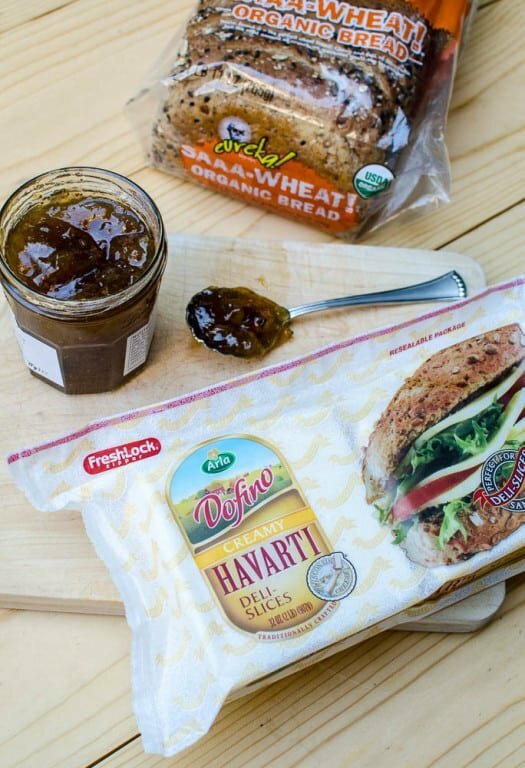 When it comes to what type of cheese to use for grilled cheese sandwiches, Havarti is a great choice. 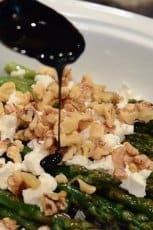 It’s naturally creamy – I mean seriously creamy, and it’s got just the right melting point which guarantees that ooey, gooey result we love so much. I’ve been a fan of this big, resealable pack of Arla Dofino Havarti Deli Slices from Costco for years. I love the convenience of the perfectly sized, pre-sliced cheese and never have any problem whatsoever putting it to very good use. Thankfully, I’ve also found smaller packages of Arla Dofino cheese in the deli section at my local grocery store for those times when I can’t make the trip over to Costco. All of the Arla Dofino cheeses have been crafted in Wisconsin for more than 100 years and are naturally good from farm to fridge. They are free of added hormones, artificial flavors and preservatives, and made with quality, natural ingredients. And, they are top notch, over-the-top, delicious! When you have substantial filling it is especially important to use a substantial, grainy bread like this Eureka Saaa-Wheat! And, honestly, I have trouble resisting bread that is called Saaa-Wheat! I mean, right? It also happens to be incredibly tasty and makes the prefect base for our grilled cheese sandwich. In my area, both Target and Walmart carry it but visit Eureka Baking Company online to find a retailer near you. Many of us have a food history with one vital component in common – Mom made a mean grilled cheese. As simple and familiar as they may seem, there are a few tricks to success. Here are a few of my tips for a great result. In addition to cooking the grilled cheese in melted butter, be sure to butter both slices of the bread as well. It will ensure a nice, evenly browned sandwich. 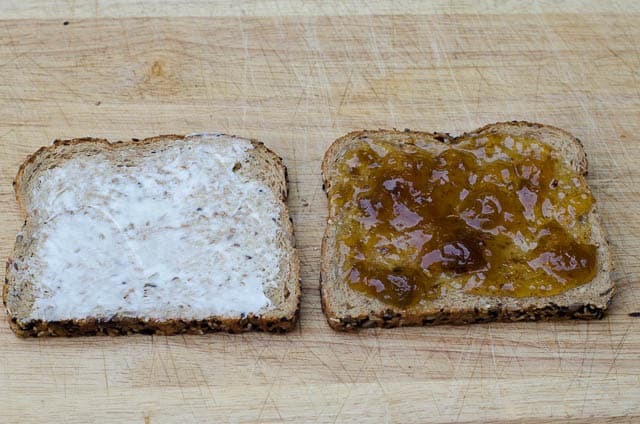 Flip one of the buttered slices of bread over and coat it with some fig preserves. 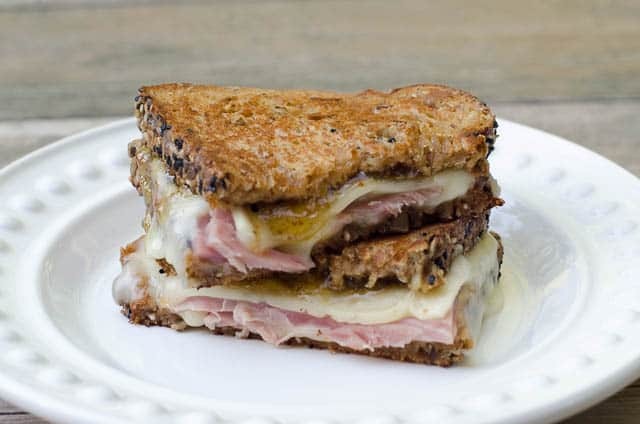 Place one slice of Havarti over the fig preserves and top it with some leftover Easter ham or your deli ham. And, finally, another slice of Havarti. One slice of cheese just won’t cut it. Place the second slice of bread on the top, buttered side up. Cook the sandwich in about 2 tablespoons of melted butter over medium heat. 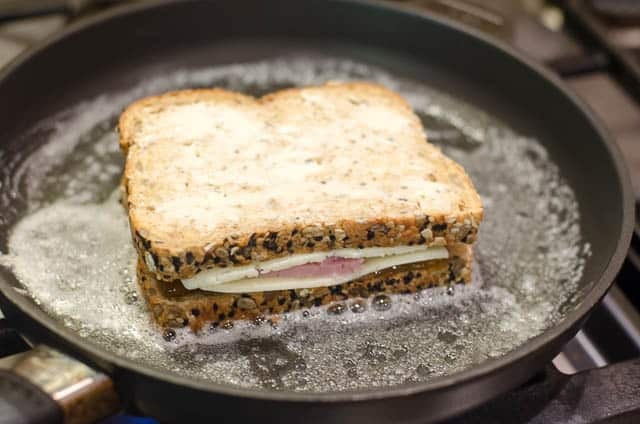 Don’t be tempted to cook it at a higher temperature – you’ll just scald the butter and end up with burned bread. 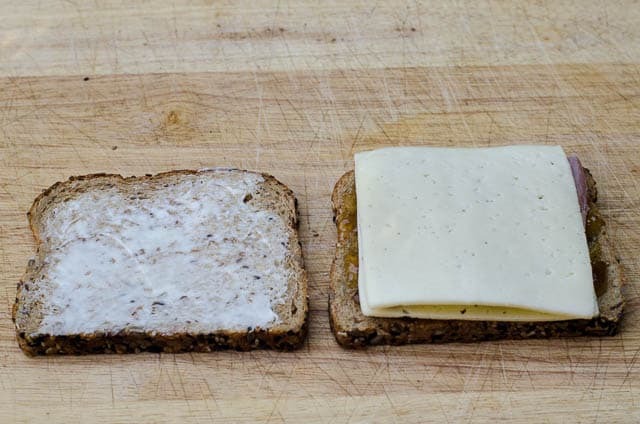 Keeping the heat at medium gives the cheese a chance to melt as the sandwich browns. 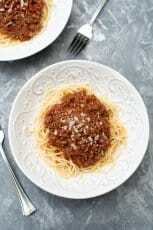 It should only take a couple of minutes to nicely brown on one side and then use a spatula to carefully flip it over and cook until nicely browned on the second side. If you’d like the cheese even more melted and gooey, cover the pan and remove it from the heat at this point. Allow it to sit, covered for a minute or two before serving. This will do the trick! For lots of delicious grilled cheese recipes, coupons, and more, visit Arla Dofino online. Now, go forth and make grilled cheese! 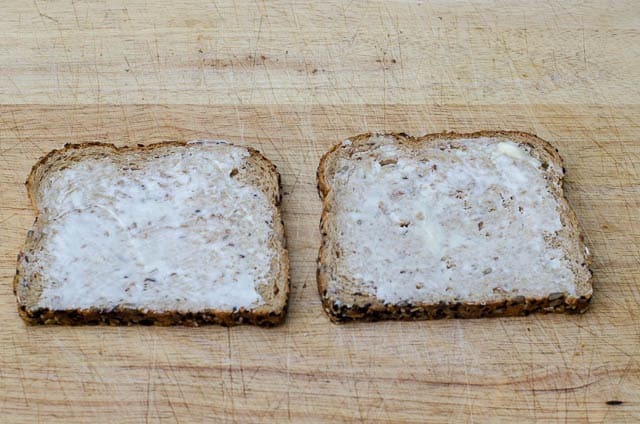 Spread 1 tablespoon of softened butter on two slices of bread. Flip one slice over and spread un-buttered side with 2 tablespoons fig preserves. Layer with one slice of Havarti (or 1/8 cup shredded), half of the ham, and top with one more slice of Havarti (or 1/8 cup shredded). 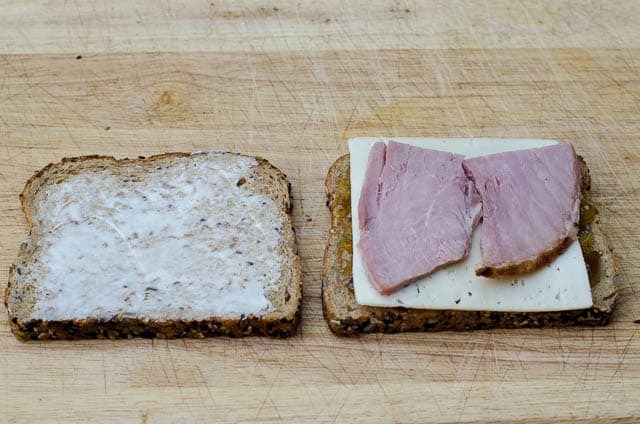 Place remaining slice of bread on top, buttered side up. Melt 2 tablespoons butter in a skillet over medium heat. Add sandwich and allow to cook until nicely browned on one side. 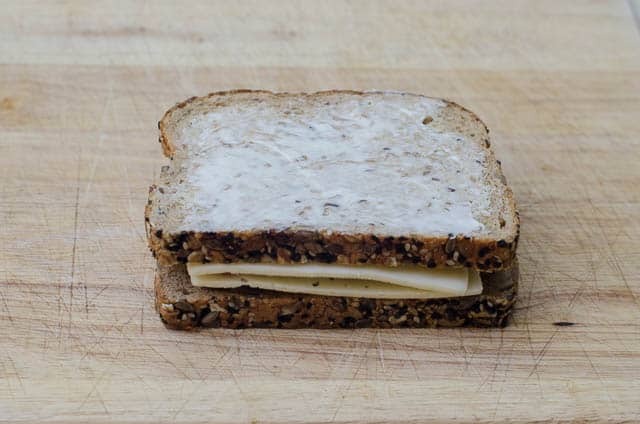 Use a spatula to carefully flip the sandwich and allow to cook until browned and cheese has melted. If necessary, remove pan from the heat and place cover on for a minute or two until cheese has completely melted. Repeat with remaining ingredients to make second sandwich. Serve warm. ooo that looks so good! 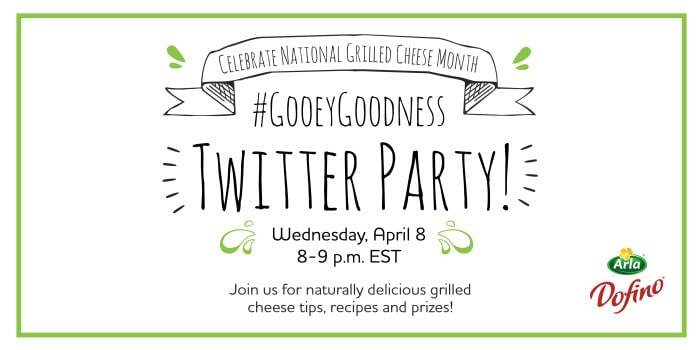 I’m loving #grilledcheesemonth!! Pinned it!! What a great Grilled Cheese sandwich! I may have this for lunch tomorrow! The addition of fig is absolute perfection!! Ahhh! 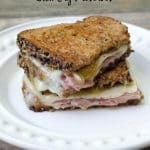 I loved grilled cheeses and this one looks amazing! Wish I had some bread on hand. Might have to make a fresh batch and use up the ham from Easter. 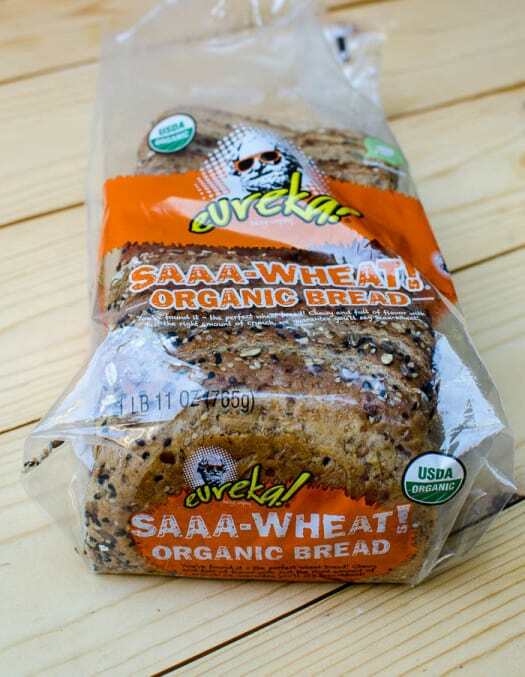 LOL, I would have trouble resisting a bread called Saaa-Wheat, too (fun)! 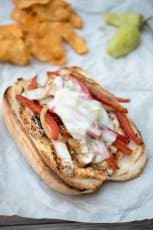 I would have even more trouble resisting this amazing sandwich – I love this combo. That hint of sweet jam is going to be great here. It’s the same principle as with croque monsieur. Such a delicious pairing with the sweet ham and savory cheese. This sounds like a fantastic sandwich! I love all the ingredients… I’ll have to try this very soon. What an awesome grilled cheese! Love the addition of the fig preserves!